Whether you’re a first-time backpacker or a seasoned traveller who’s visited the city before, chances are Chiang Mai is high up on your travel wishlist. This northern Thai city is adored by the backpacking community and every time we return, we fall in love with it a little more. But what is it that makes Chiang Mai one of the most popular backpacking destinations in the world? Anyone who’s been before will know this city has a special vibe. It’s creative, spiritual and relaxed, so if you’re still reeling from the intensity of Bangkok, this is the place to take it easy. A typical Chiang Mai morning involves hanging out in a quirky coffee shop and watching the world go by, and this café culture is one of the things that’s cemented the city as a digital nomad hotspot. The nightlife is equally laid-back – forget swanky nightclubs with strict dress codes, in Chiang Mai it’s all about live reggae jams in casual bars. But chilled doesn’t equal boring and there are heaps of things to do in Chiang Mai. Take a stroll inside the Old City walls to learn its history and discover incredible architecture – including some of Thailand’s most jaw-dropping temples that are a must visit. Sharpen your haggling skills at one of the city’s markets; like the Sunday Walking Street Market where you can pick up unique garments and handmade jewellery. Chiang Mai is also the best spot in Thailand to make friends with some elephants – just make 100% certain that you do your research and only visit sanctuaries that you know are ethical. Oh, and one more thing. It’s no secret that food in Thailand is amazing, but Chiang Mai is on another level. You’ll find some of the best street food at the city’s markets, and one thing you cannot leave without trying is the famous khao soi noodle soup, a Chiang Mai speciality. If you can’t bear the thought of leaving it behind, sign up for a cooking class and take your skills back home! Now that you’re suitably pumped for your adventure, here are the 20 best hostels in Chiang Mai. Worried about visiting Chiang Mai solo? Here are a few reasons why you shouldn’t be. Firstly, it’s one of the most popular destinations on earth for solo travellers, so you’ll be in great company. It’s a safe city with the friendliest locals, so you shouldn’t be concerned about heading out sightseeing on your own. 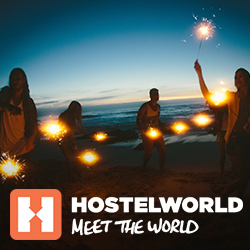 Plus, it’s got awesome hostels where the atmosphere is so social it’s impossible NOT to make friends… here are a few! The fact that our guests voted Hostel Lullaby among the top 10 hostels in the world for solo travellers at our 2019 HOSCARs means we probably don’t need to say any more… but we can’t shut up about this place! It’s not a party hostel, but group activities like free yoga sessions and Thai cooking classes provide an alternative to boozy ice-breakers. They know that food is the key to our backpacking hearts and offer a killer breakfast spread every morning for free, with everything from pancakes to grilled pork with sticky rice. And if safety is a concern to you as a solo traveller you’ve got 24-hour security and a prime location in the heart of the Old City. Free bottomless snacks served all day! ‘Wow’ pretty much sums up our feelings about this fantastic hostel and its superstar host Khai, who our guests say is “incredibly kind” and “welcomes his guests as friends”. He makes sure that no solo traveller stays solo for long, by cooking family style dinners and organising nights out, movie marathons and market trips. It’s easy to meet other guests at any time in the common areas, where there’s usually a game of cards or a guitar singalong to join in with. Don’t worry if your inner Beyoncé is a little shy, a couple of frozen cocktails from the bar are bound to bring her out! This hostel is great for all nomads, but is particularly loved by our female guests, who voted it the second best hostel in the world for solo female travellers at our 2019 HOSCARs! It’s the perfect balance between party and chilled, with a cheap bar and group activities every night that make sure guests feel part of the Stamps family. The dorm set-up is ideal if you like your personal space, as beds are inside their own spacious cubicles – you can enjoy the fun and games downstairs and retreat to your pod when you’re ready for some privacy. The Entaneer is a bit of a newbie on the Chiang Mai hostel scene, but the reviews are in and our solo guests can’t stop raving about it! They love its ‘trendy warehouse style’, ‘brilliant location’, ‘lovely events’ and, most of all, the ‘amazing staff’. It’s run by a local family who love joining their guests for communal meals and activities, and you can feel the warm, homely vibes from the moment you step inside. Like seriously, you’ll probably want them to adopt you. But, you’ll want to mingle with other travellers too, so hang out in the gaming zone, outdoor terrace or stylish bar, where magical travel connections are formed (the cheap beer helps). Glittering golden temples, fiery sunsets and world-class food – FYI, Chiang Mai can be a pretty romantic city! If you’re planning a visit with your significant other, don’t think you’ll have to miss out on the hostel fun. These couple-friendly options have that warm hostel atmosphere, plus a few additional creature comforts that’ll earn you some serious brownie points. If you and your partner want to truly chill out Chiang Mai style, look no further than Baan Heart Thai, a hostel so laid-back it’s practically horizontal. This family-run joint has its own library, a yoga and meditation space and offers free bicycle rentals so you can take a slow cruise through the nearby Old City. The rooms are stunning – picture traditional Thai design with a chic twist – and there are even spacious pod-style queen beds in the superior dorms. And on top of all this, its central location means you’re never far from the action despite feeling like you’ve got your own private hideaway. Bliss! If you’ve got an eye for design then you’ll love this ultra-stylish hostel in downtown Chiang Mai, close to the night bazaar, several temples and countless restaurants… did someone say date night? The bathrooms are modern and clean, the dorms are a thing of beauty and the privates are another-level-luxurious if you want to splash the cash (and even these start from just £25). There’s a killer free breakfast of waffles, eggs and fruit that’ll fix you up for the day’s adventures – just borrow a scooter from reception and you’re set to take Chiang Mai by storm! Travelling couples love this boutique hostel, set in a colonial-style building with some funky, contemporary twists. They’ve got peaceful co-working spaces, perfect for all you digital nomads or anyone who wants to stay in Chiang Mai for the long haul. Their luxurious rooms are the sort that make you wanna extend your stay too – the privates have en-suites, individual workstations and even a personal terrace, so you can enjoy your morning coffee in peace under the Chiang Mai sun. Make sure you join in with the fun, creative activities, like traditional lantern crafting and releasing in the garden – now you know that sounds romantic! Amazing staff – hit them up for insider tips! This homely, rustic hostel is impeccably clean, with modern facilities and cosy hang outs like the bright greenhouse lounge and hidden reading nooks. The rooftop terrace has mountain views and it’s worth getting up in time to catch a sunrise from up here, trust us! In the evenings this area turns into a chilled, social spot where backpackers swap stories over beers and good tunes. Don’t forget to make the most of the free cook-your-own breakfast in the morning. Chiang Mai’s nightlife isn’t Full Moon Party, Khao San Road style craziness. It’s more about hanging out, listening to music and swigging beers from the side of a campervan (one of Chiang Mai’s coolest bars, BTW). Before heading to check out what the Old City has to offer, get the night started at one of these Chiang Mai party hostels! Okay, I know what I just said, but this hostel didn’t get the memo – Bodega parties are wild! In the bar you can expect plenty of free shots and nightly games, like Saturday night beer pong tournaments and ‘thirsty Thursdays’ where there’s a new drinking challenge every thirty minutes. On Wednesdays, tag along to Chiang Mai’s biggest (and most legendary) pub crawl with the whole Bodega crew for the most memorable night you’ll ever forget. In the morning, join the group trip to wash away your sins with a dunk in the Chiang Mai Grand Canyon, or just chill in the pool if you’re particularly fragile. Then it’s time to do it all again! Deejai knows how to party in the Chiang Mai sense – expect boozy BBQs, foosball tournaments and campfire jams. Whether you’re playing volleyball in the pool, swinging in a hammock or tucked away in the treehouse, the vibe is lively and friendly. The playlist in the bar is bound to get you in the mood, as are the cheap drinks deals (they had us at cheap). Be sure to take full advantage of the group trips that Deejai’s arrange too – mountain trekking and ziplining through the jungle are just more fun with new hostel bezzies! Brick House has only just reopened after a huge refurb, so expect brand-spanking new facilities and impeccable cleanliness. It’s a large hostel with 200 beds, so you can imagine the atmosphere when everyone’s gathered round the massive bar area or cheering on an intense volleyball tournament in the pool! It’s a hostel with true party spirit, so prepare for lots of cheap drinks (flaming cocktails have been known to make an appearance) and the time of your life. But there’s a healthy balance and plenty of spots to take it easy too – you can read on the sundeck, munch on delicious Thai or western cuisine in the café or sweat it out in the fitness centre. Life on the road can get hectic – it’s not just glampackers who need their own room sometimes! Even the most seasoned travellers can suffer from dorm fatigue and it’s important to put some you time aside. That’s where these hostels and their incredible private rooms come in – treat yo self! You’ll find Oxotel right in the middle of Wualai Road, Chiang Mai’s busiest street on Saturday when the Walking Market takes place. After browsing to your heart’s content, you can observe the chaos from your own private balcony, in your dreamy room with a HUGE bed, plush pillows and towels and a flatscreen TV. Swoon! If you can pull yourself away, enjoy Chiang Mai’s café culture in the gorgeous artisanal coffee shop downstairs, or practice yoga in the green outdoor common area. Oxotel describes itself as ‘a relaxing resort hostel’ and we think this sums it up perfectly. You can’t help but be charmed by the quirky, industrial style of 248 Street Hostel – and when we say ‘quirky’, we mean that the bathroom sinks are made from tyres and there’s a vintage motorbike in the lobby. But hey, you’re probably more interested in the rooftop pool and open-air bar. Yeah, hanging out in the water with a Chang beer in hand, surrounded by mountain views and overlooking the Old City does sound pretty sweet! Their super-budget double and single bed privates mean that you can afford your own room even if you’re travelling solo – but thanks to the party space on the roof you’ll never miss out on the fun! The great news about Chiang Mai hostels is that they’re all pretty central, but if you’re all about location, location, location then these are the ones for you. They’re ideally situated in the Old City, close to all the best markets, foodie spots, temples and bars, so exploring Chiang Mai couldn’t be easier – what are you waiting for?! We’ve got another HOSCAR winner on our hands… this was our most popular hostel in Chiang Mai for 2018! We think that the epic rooftop bar with its nightly parties, live DJs and insane happy hour might have something to do with this. Three beers for £3? This could get messy… Inside things are more chill, with quiet cosy spots for group Netflix binges. Our guests recommend their day trips to elephant sanctuaries, cooking classes and jungle trekking for a unique experience with some awesome people. There’s also a restaurant on site serving up Thai classics with plenty of vegan options. The food is great, but even better when enjoyed from the roof with a view of Doi Suthep mountain. Perfect location for foodies – street food heaven! If you’re a bookworm at heart (guilty ) you’ll love the library layout, heaps of books and hidden reading spots at the cosy AF Hobnob Hostel. It emulates the city’s café culture, with lots of green, airy spaces to hang out with a coffee, chat to other backpackers or tap away at a laptop. It can be difficult to leave this tranquil little haven, but fortunately its amazing location means you’re only a stone’s throw from Chiang Mai’s most exciting attractions. The famously opulent Wat Phra Singh temple is just metres away, and the Sunday Walking Market takes place on the same street. This super modern hostel ticks all the style boxes with its minimal, monochrome design. It’s got enclosed, pod-style dorms with individual reading lights and power sockets for maximum comfort, while its welcoming atmosphere and plenty of co-working spaces make it an attractive option for digital nomads. They also throw in loads of extras at no additional cost – like toiletries, hairdryers, bottled water, barista style coffee and a buffet breakfast – because they know no one loves freebies more than a backpacker! Thunder Bird Hostel is so cool it hurts. Picture chic, industrial style gone wacky, with things like giant black and white bird’s heads dangling from ceilings and painted on walls (stick with us here). Its on-site coffee shop and bakery ‘Greedy Beast’ wouldn’t look out of place on an East London street, and is a trendy spot to hang out and work over an Insta-worthy cappuccino. There’s even ping-pong tables to channel your inner Forrest Gump, and a grand piano if you’re partial to tinkling the ivories – because why not? Foodies rejoice! Not only does Muan Hostel have an unbeatable Old City location opposite Thapae Gate (AKA street food heaven), they also serve out-of-this-world Thai cuisine from their local restaurant, plus a killer breakfast buffet that’s 100% free! They’ve got those chilled Chiang Mai vibes down to a tee, especially in the lantern-lit social spaces and quirky hammock café (yes, that’s a thing). Be sure to sign up to the cultural activities led by the staff, like traditional lotus folding workshops, and treat yourself to a few souvenirs from their local craft shop too! BRB, just booking a flight to Thailand! Which of these awesome hostels will you choose for your Chiang Mai adventure? Let us know in the comments!